Have you heard? There are 19 more Saturdays until Christmas. Do you have your decorations figured out for this year, gifts lined up, projects ready to go to the finisher? We don't either, but now is a good time to start. First up on your project list if you are a needlepointer can be the "My Favorite Things" ornaments from Rebecca Wood Designs. 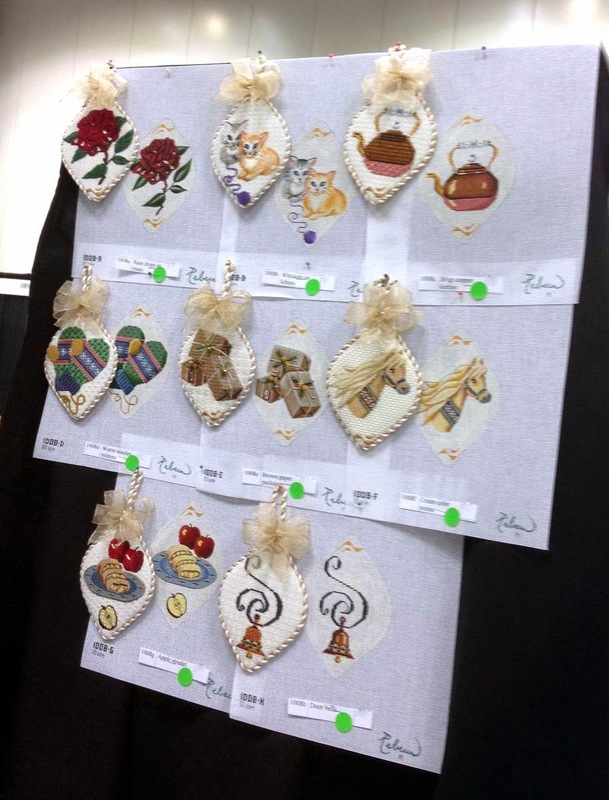 We saw the finished models at this summer's TNNA tradeshow, and can attest that they are gorgeous. The colors are classic, the ornament sizes are ideal for standard trees, and the stitched details are fun. The designs are brought to life by Cynthia Thomas, who created stitch guides for the series. Side note: If you are unfamiliar with "stitch guides," they are printed (or PDF) pages that give you suggested fibers, stitches, and stitch diagrams to make a design. If you've ever stared at a blank canvas wondering how to go beyond basic tent and continental stitches, stitch guides will be helpful. Cynthia is one of the top stitch guide writers in the needlearts community who works with just about all of the needlepoint canvas companies. We adore her not just because she loves Kreinik threads and is super nice and fabulous, but she's got a great mind for interpreting needlepoint through stitches and fibers. So you are in good hands if you have a Cynthia Thomas stitch guide. But back to this ornament line… The designs include raindrops on roses, whiskers on kittens, bright copper kettles, warm woolen mittens and all the references mentioned in the song "My Favorite Things" from The Sound of Music musical/movie. They would make an heirloom addition to your holiday tree, or a gift for a new bride and groom, grandchild, or anyone else who will have their own trees to decorate each holiday. The theme is so classic, it will never go out of style*. Take a look at the photos below, and visit our Flickr page for more. To get the canvases and stitch guides, contact your local needlepoint shop or favorite online needlepoint source. Anyone else now hungry for some crisp apple strudel or schnitzel with noodles? * Did you know: "My Favorite Things" has been recorded by a range of artists including Julie Andrews, The Supremes, Carrie Underwood, Barbra Streisand, the cast of Glee, John Coltrane, Andy Williams, Kelly Clarkson, Tony Bennett, Kenny Rogers, Outkast, and Mary J. Blige among others.